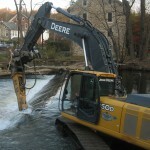 In July and August of 2012, FRWA is coordinating the removal of Spoonville Dam. Here are answers to some frequently asked questions about this project. 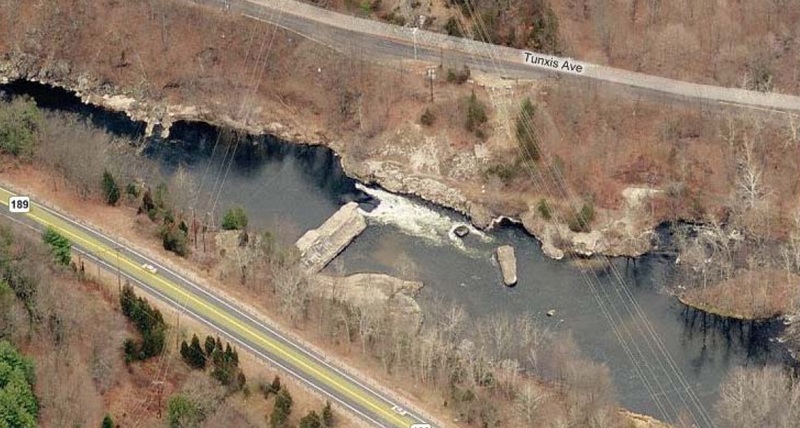 The dam owner is Connecticut Light and Power, a subsidiary of Northeast Utilities. CL&P is in favor of removal and has contributed substantial support for the project. Why is the dam being removed? 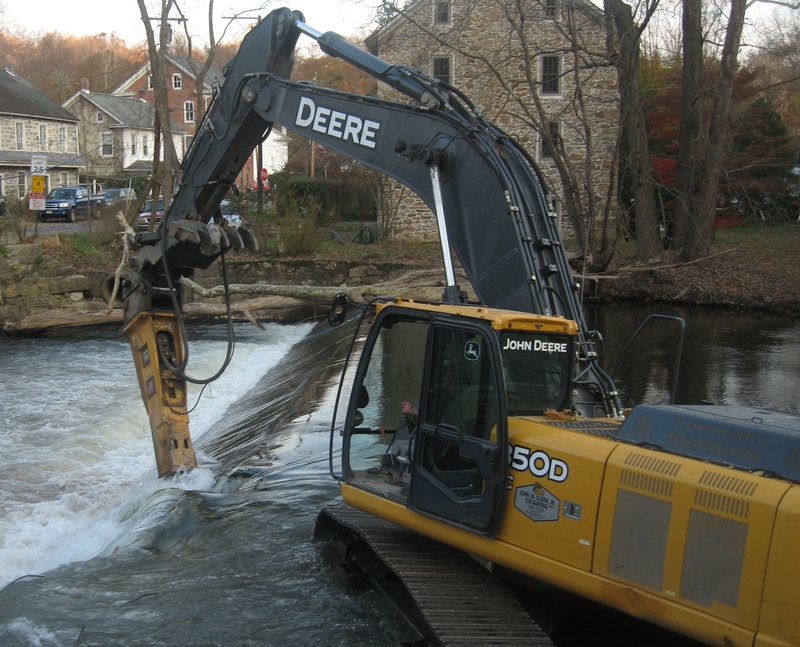 Taking the dam out is one step in a multi-part, long-range effort to restore historic fish migrations in the Farmington River. The removal will also improve both the beauty and the safety of this part of Tariffville Gorge. Details: Built in 1899 on the site of a natural 25-foot drop in the riverbed, the dam was originally a hydropower facility. The hurricanes and flood of 1955 breached the dam, opening a 45-foot gap and scattering massive dam fragments in the riverbed downstream. The remnant of the main dam has persisted for decades as a 128-foot long, 25-foot high obstacle in the channel. The river pours through the breach in a steep, fast chute that stops American shad from proceeding further upstream to spawn. Migrating shad typically stall just below the chute. 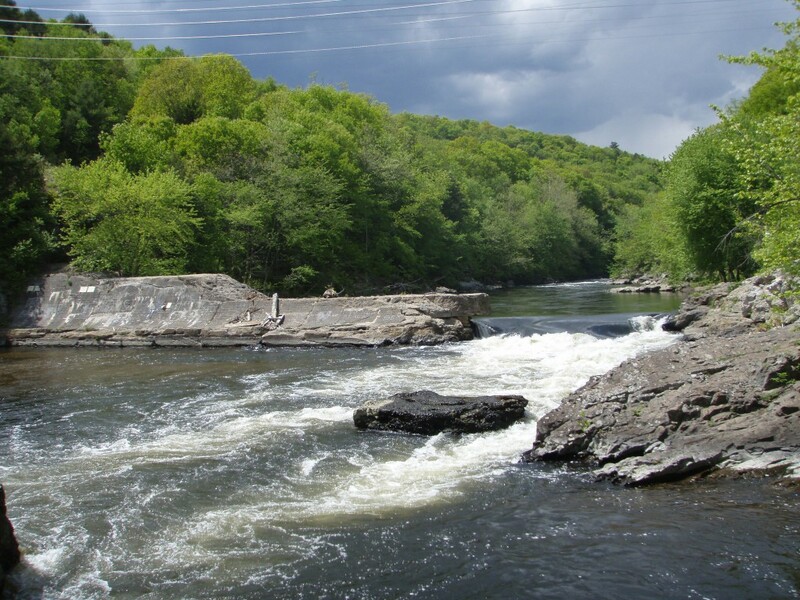 Removing the dam will spread out and slow the flow and restore a more natural riverbed, allowing shad (and other species) to swim upstream more easily. Overall organization has been handled by FRWA, working closely with CL&P. Technical advice and permitting were provided by CT DEEP along with the US Army Corps of Engineers. Project design and oversight are by the engineering firm Princeton Hydro. Construction is being done by Gleim Environmental Group. How is it being removed? • A temporary access road will be constructed along the river bank to the dam, and across the riverbed to the dam fragments. • River flow will be maintained by temporary culverts under the access road. • The dam will be taken apart by machine—not explosives. All the concrete will be trucked off the site for disposal. • After removal, the access road will be taken up and the site will be restored with plantings. All the dates below are subject to change, depending on weather and other variables. • June 21: Equipment arrives. • June 25: The crew arrives and begins preparing access to the river. • July 2: Construction of the access road begins. • July 5: Demolition of the dam begins. • Early August: Anticipated completion, if conditions allow. During construction, how will the work affect the river and the neighborhood? • Daily schedule: Work hours will be Monday through Friday, approximately 7 AM to 6 PM. • Traffic: Please be aware that dump trucks will be entering and exiting the site on Rte 189. There will be no construction traffic for this project on Tunxis Avenue or Spoonville Road in East Granby. • River flow: Flow is not likely to be altered significantly during construction. There are minimum required flows for aquatic life and for power generation. These are expected to be maintained throughout the project. What about the whitewater paddling run just upstream? Will it be affected? During construction, any paddlers in Tariffville Gorge should plan to exit the river well upstream of the work site. Paddlers should absolutely not attempt to paddle near or through the work site. Why were trees cut down? The clearing of trees on either side of the Gorge near the dam is connected with CL&P’s transmission line project, not the removal of Spoonville Dam. I see that there’s an archaeological dig going on. What are the results of the dig? Again, the archaeological work at this site is connected with CL&P’s transmission line project, not the removal of Spoonville Dam. Questions about this should be directed to CL&P rather than FRWA. The project is supported by the CT Environmental License Plate Fund, Connecticut Light & Power, the Long Island Sound Futures Fund, and the Hartford Foundation for Public Giving. Where can I find updates on the project’s status? Look for news bulletins on the FRWA website or send a query by email to efielding@frwa.org. If you have an urgent question, give FRWA a call at 860-658-4442 x205.